Elsie and Frances_01 is an installation of a unique concave frame, made out of Baltic plywood, hung on the wall with a digital chromogenic print mounted to its surface. The image is produced with chromogenic prints made in the darkroom using double exposures and camera-less printing on an iPhone. 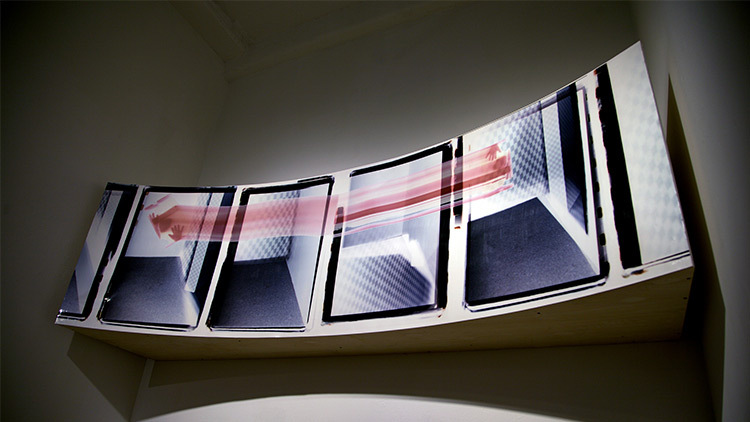 Near this panoramic image is an automatically advancing slide projector lighting an invisible cube with slides handmade out of universal flash gel lighting filters. To see more work, visit amt.parsons.edu/finearts/2017mfathesis/artists/cali-kurlan.